As beautiful and practical as they are, tiled floors have one big drawback - they are chilly to walk on. Once experienced, there can be no doubt that under tile heating transforms the ambience and experience of walking on a tiled floor forever. One might even go as far as to say that warm tiles are nicer than carpet to walk on! A warm tiled floor doesn't stay wet for long. Apart from the safety element (dry floors aren't so slippery), a warm dry floor prevents the growth of bacteria and mould and therefore the odours associated with dampness. Some under tile heating products are not compatible with the Tilesafe tanking system. The Aqua Mat however is ideally suited with a maximum output of 100W / m2. Aqua Mat is economical to run and gently heats the floor to a comfortable level, making it a sheer delight to walk on with bare feet. It does not heat the floor to such a temperature that could cause damage to the waterproofing membrane. 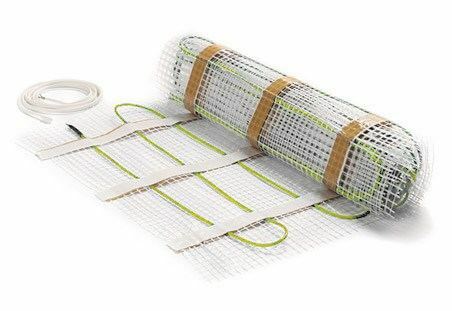 The Aqua Mat 100 is mounted on a mesh at exactly the correct pre-determined spacing as the element meanders making it easy to handle and simple to lay. The AQUA MAT heating element is only 3mm thick and easily installs within the adhesive layer under the tile. Care should be taken when applying the adhesive that the combing trowel does not cause damage to the heating element. What does Aqua Mat kit comprise? Aqua Mat is supplied on a roll of webbing. The roll which is 500mm wide varies in length according to which kit you buy. The longer the roll, the higher the total kW output and the bigger the area the roll will cover. You should measure carefully when calculating what you need. Remember, you must use the whole role (you can't cut a piece off if you discover it's too long). Aqua Mat requires a controller. This unit not only switches power to the Aqua Mat on and off, but allows you to program when. The controller monitors the floor temperature via a floor sensor probe (supplied with the programmer) and displays a constant reading. You are in total control.